ICACCI 2014 requires that the submitted manuscript is solely from the author's own work and not from the work of others, unless explicit permission has been granted. This includes text, figures and tables. Information from published articles must always be cited explicitly. Proper citation is to give the credit to the work that is originally published, not to follow-up work or reviews. Citations should be given close to the information within the sentences or at the end of the sentence, not after several sentences or near the end of the paragraph. Even when citations are given, exact copying of a whole sentence or paragraphs should be indicated by quotation marks. Furthermore, reuse of part of a published figure or table requires a copyright permission from the publishers that hold the rights. All re-published figures and tables should explicitly indicate the original source. Plagiarism is viewed as a serious offense by IEEE and ICACCI and some cases could lead to a ban of 5 years in any IEEE publications besides notifying your institution and research funding agencies. Enter Registration Code Printed on the Receipt. a) Check that title and abstract in EDAS match your camera-ready paper exactly. Please use Title Case for the paper title, i.e. capitalizing all main words. b) Compare all author names in EDAS with the author list in your paper. They MUST BE identical and in the same order. This is very important because we will be using the information provided in EDAS to generate the final conference program and the table of contents for Proceedings. c) Please ensure that the abstract and title should be readable stand-alone and not contain any references or unexplained acronyms. You are allowed to modify abstract and author list yourself. d) You cannot modify the title for the paper, please send a mail to icacci2014@gmail.com if that is necessary and give a valid reason. Click the My papers tab. Click the upload icon and a dialog box will open that will enable you to select and upload your paper via the web or FTP. 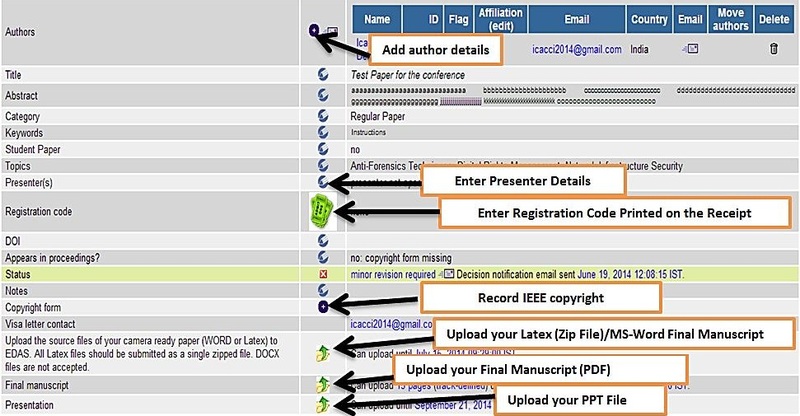 You need to upload source files of your camera ready paper (MS-WORD or Latex) too on EDAS. All Latex files should be submitted as a single zipped file. DOCX files are not accepted. Submit IEEE Copyright through EDAS. An IEEE Copyright Form must be submitted for each paper. The IEEE is enforcing strict copyright rules. For your convenience, the copyright is made available electronically through EDAS. To upload copyright forms, first log into EDAS, then go to "My Papers" tab and click on the '(c)' icon under the column "Copyright Form" where your paper is located. You will be redirected to the IEEE Electronic Copyright Form website. Please provide carefully the answers that best apply to you. Once the copyright form has been successfully recorded, you will receive a confirmation email. All papers submitted through EDAS Portal are considered to be in final form and ready for publication. Do not submit your paper until you are ready. A good suggestion is to have a few colleagues review your paper to provide final remarks on its suitability before submitting it through the web site. An accepted paper will be published in the proceedings only if the final version is accompanied by the registration and payment information for at least one of the authors. Online Registration information is possible through the following link: http://icacci-conference.org/website/registration . ICACCI 2014 registration fee includes the IEEE conference proceedings, admission to technical sessions, coffee breaks, lunches, and banquet. At least one author must attend the conference to present his/her papers. To clarify your situation or if you have any questions, please email to the Conference Secretariat at secretariat@icacci-conference.org. Be sure to register by August 22, 2014 to ensure that your paper is included in the proceedings. Registering late may mean that your paper may not appear in the proceedings. There are several accommodation hotels in Greater Noida. A list of suggested hotels has been posted at http://icacci-conference.org/website/hotels-travel-visa. If you'd like to stay at one of these nearby hotels please make your reservation as early as possible.